Looking for things to do while staying in your Elite Holiday Home? This list will keep you busy, with all bases covered from shopping and dining, to soaking in the sunshine and exploring the outdoors. One of the Gold Coast’s most unique features is its diverse scenery. From vast, pure white beaches, to high-rises, and lush rainforests, this city has it all. Viewing it from the sky too is quite an experience. 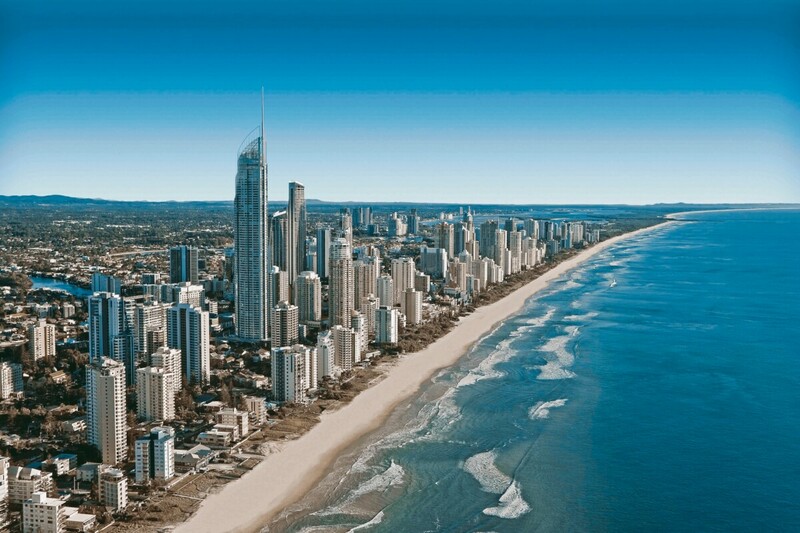 At Q1 Sky Point Observation Deck, you can look out east to the sea, and west to the green hills, while standing amongst the high rises of Surfers Paradise in the seventh-tallest residential building in the world. This beachside suburb is a hipster hub, offering up some of the Gold Coast’s most popular eateries, including Justin Lane, Rick Shores and Harry’s Bistro. On James Street, you’ll find plenty of Acai bowl and fresh juice vendors (Helen’s being the most renowned), fashion boutiques and homeware stores. For a change of scenery, in a mere 45-minute drive you can find yourself amongst the tall trees and majestic waterfalls at Springbrook National Park. You can drive the Springbrook circuit, take one of the many bushwalks, or have a picnic while you take in the view of Gold Coast to Byron. For the Gold Coast’s best croissants, danishes, and fresh baked sourdough, look no further than Bam Bam Bakehouse. It’s not just a bakery, but an artisan patisserie, bistro, and specialty coffee house. There’s always something novel and adventurous to try too – s’mores pots, hot cross bun danishes (yes, that’s a hot cross bun wrapped up in heavenly danish pastry), or karage chicken croissants, just to name a few. Ever wanted to get a photo hugging a Koala? Currumbin Wildlife Sanctuary is the place to do it. Feeding the Lorikeets is another popular attraction at this southern-Gold Coast gem, and is a favourite amongst young families. Pacific Fair is more than a shopping centre, it’s an experience. Since its revamp in 2016, the shopping resort has become home to the world’s biggest designer brands, in a setting that is nothing short of luxury. Dreamworld, WhiteWater World, Wet ‘n’ Wild, Seaworld, and Movieworld. Choose one or do them all. The kids will love you forever! Tallebudgera Creek is where the ocean flows into a peaceful, bright green stream, underneath the south side of Burleigh Hill. As a local favourite, our tip is to get there for an early morning dip when the water is at its clearest, and the car spaces are aplenty. Balter is one of Mick Fanning’s latest projects and has quickly gained pace as one of the Gold Coast’s favourite beers. Stop in to the Currumbin Waters brewery to see where the magic is made every Friday, Saturday and Sunday afternoon through to evening for beers and a bite in a slick, industrial setting. Fact: There’s only one Gelato Messina in Queensland, and it’s in Coolangatta on the Gold Coast. This Sydney-born ice creamery is arguably Australia’s most revered, and for good reason. The unique menu of flavours span from poached figs in marsala, to apple pie (with real apple pie pieces) and salted coconut and mango salsa sorbet. And since it’s sunny pretty much all year round on the Gold Coast, there’s always room for ice cream.